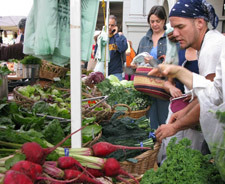 All summer long, folks line up at the Green Gulch Farm stand to have their pick of big, bountiful, “enlightened” greens. The stand has a loyal fan base, but not everyone knows exactly what to make of the little Zen farm. What does Buddhism have to do with organic produce? Before living at Green Gulch, I imagined bald monks mindfully hoeing baby lettuces, whispering sutras over Brassica seedlings, and strolling meditatively through apple orchards. As a farm apprentice last summer, I awakened to the realities of farming at the meditation center. Situated near the coast of Marin on an inholding of the Golden Gate National Recreation Area, Green Gulch Farm includes six acres of mixed vegetable fields, fruit trees, and a flower garden, all of which are open to visitors. 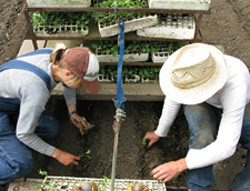 Lovingly tended by Zen students for nearly 40 years, the deep, fertile clay loam, combined with mild summers and coastal fog, create the ideal conditions for lettuces and other cool-weather crops. There are about 15 residents who maintain the farm and garden, with the help of volunteers. Another 30 or so residents manage the practice center’s kitchen, guesthouse, and Zen training programs. The farm offers produce from late May through October. The rest of the year, farmers spend the dark winter hours meditating, while the fields are put into cover crop to rest and renew. Working on the farm was a constant practice in such reflection — not passive reflection but hard, physical work. We became intimate with our food through this work, which means feeding the soil, caring for plants, and doing our best not to put extra stress on the watershed and creatures around us. The land returned this care and effort to us with beautiful vegetables. Zen teachings emphasize the interdependence of all life, and all aspects of farming bring us in touch with this interconnectedness. 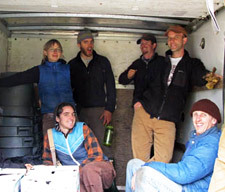 For example, Green Gulch compost includes food scraps from the farm’s kitchen, San Francisco Zen Center, and Greens Restaurant. A horse stable down the road provides manure for the compost, and plant matter comes from the pond, which also irrigates the crops. This cycle of resources (work-produce-kitchen-compost) is a tangible loop that farmers experience every day. During the height of the season, the farm and garden crew is joined once a week by the rest of the residential community, who support other parts of the practice center. In silence, everyone hoes rows of greens, pulls beets, or digs potatoes. This activity strengthens community, infuses our work with mindfulness, and makes lighter labors of some of the bigger tasks on the farm. Service is another mission of the farm. Green Gulch partners with Marin Organic’s Glean Team, which delivers fresh vegetables to schools and underserved communities, and the Free Farm Stand in the Mission, which improves food access for people in need. The farm has also donated seedlings to schools and urban garden projects, including Edible Schoolyard, Koshland Park, Growing Home Community Garden, Hayes Valley Farm, and Glide Memorial. Living at Green Gulch gave me immeasurable gratitude for the dynamic interconnection between growing, cooking, and eating food, and the web of life that supports this exchange. I’m not sure if that makes for Zen vegetables, but it does make my food feel closer to home. Brie Mazurek (at the top left in the above photo) is a former cookbook editor. She now lives in San Francisco, where she explores urban food and sustainability, volunteers at Hayes Valley Farm, and connects Green Gulch with garden projects in the city. Green Gulch photos by Steph Wenderski; see more here.